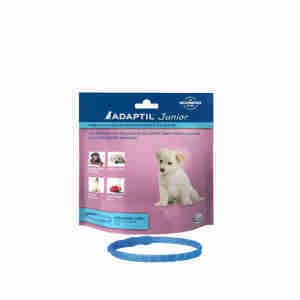 The Adaptil Junior Collar is an effective way to help comfort your new puppy and assist with their learning. Mother dogs release comforting messages to their puppies through the mammary zone. Known as pheromones, these dog appeasing messages are odourless and can only be picked up on by dogs. Adaptil is a synthetic copy of these messages and provides a strong signal of comfort and security for your puppy. By using the junior collar, it helps to introduce your puppy into the home and minimise distress. When we bring new puppies into our homes it can be a really exciting time for us. However, this can sometimes be a daunting experience for your pup. They may cry at night, feel separation anxiety from you when you leave the house and be confused by the objects in their new home. Adaptil can help to ease this transition and help your puppy feel secure with their new family. One collar will last 4 weeks and it can be cut to size. Fits necks up to 37.5cm with a maximum weight of approximately 15kg. Wow - nights are easier!